NEW 2019 CRESTLINER 1750 FISH HAWK SIDE CONSOLE. REAR JUMP SEATS 115HP 4 STROKE MERC. BLACK ON BLACK COLOR FULL VINYL FLOOR. PLATINUM PACKAGE & COMFORT PACKAGE.BOSS STEREO & MORE! Take Fishing To New Heights. 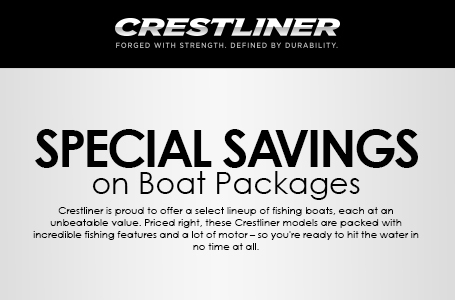 The Crestliner 1750 Fish Hawk is our newly designed 17-foot multispecies fishing boat. Our most popular series of fishing boats just got even better with a redesigned gunnel and reimagined console that includes room for 12" electronics, two drink holders, illuminated toggle switches and a 12V power outlet. You'll sit at the helm of a revamped fishing experience. New on the 1750 Fish Hawk are options for stern jump seats for added comfort. The Fish Hawk's center rod storage holds up to five 7'6" rods and five 7' rods. With a powerful engine producing a 150 HP max capacity, you and up to five friends will be ready to take on the day. The 1750 Fish Hawk also features a 15-gallon aerated stern livewell and a 12-gallon aerated bow livewell to house everything you catch. 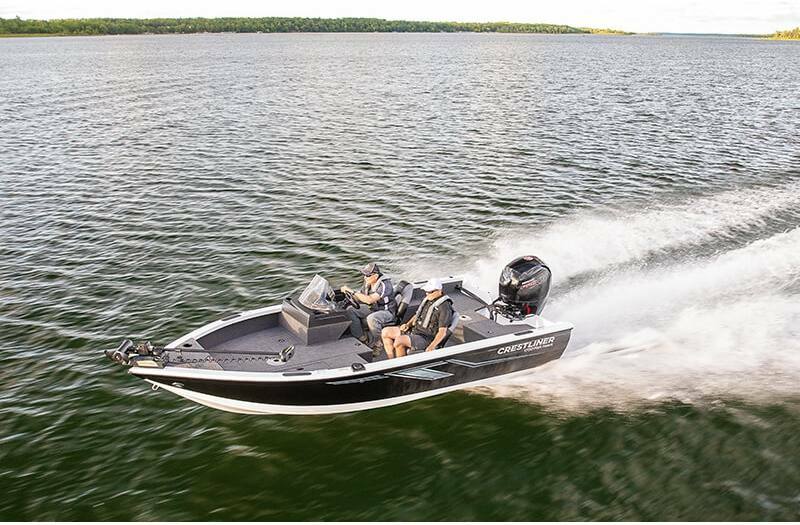 You have the option to choose from a side console, dual console, or walk-through configurations as well as new, limited edition paint options so your Fish Hawk is unlike anything else on the water. And with the all-welded strength of Crestliner making the Fish Hawk easy to maintain, you can boat anywhere with peace of mind and focus on the one thing you came to do: fish. 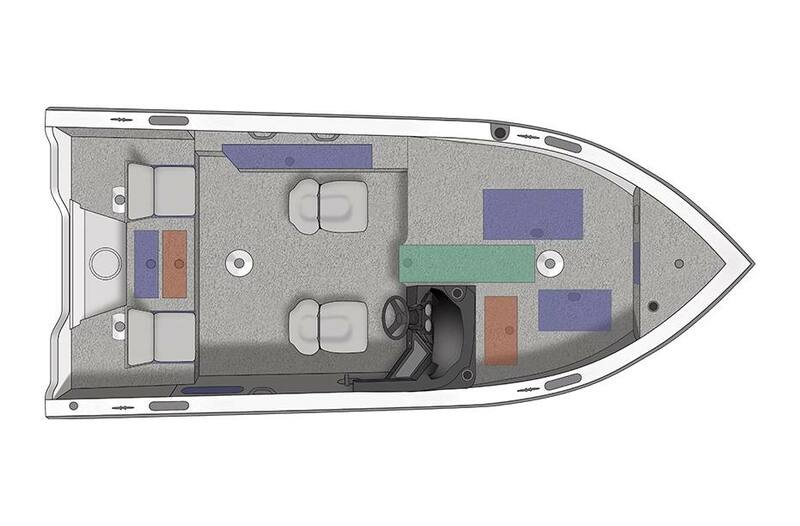 Multiple Configurations: With our innovative hull design, the Fish Hawk sports a wider, more spacious cockpit for you to navigate. Configure your Fish Hawk as a Side Console, Dual Console or Walk-Through. New! Premium Console Design: A sleek new console design fits 12" electronics and features illuminated toggle swtiches, two drink holdersa nda 12V power outlet. Bow Casting Platform: A large bow casting platform allows for easy maneuverability onboard. Deep storage compartments stow lots of gear. SureMount Gunnel Accessory System: Removable SureMount aluminum accessory brackets lets you slide your favorite accessories along the gunnel for perfect placement without drilling. Bow Livewell: The 1750 Fish Hawk features a 12-gallon bow aerated livewell with timer. Center Rod Locker with Battery Storage: Locking center rod storage holds up to ten rods; five 7'6" rods and five 7' rods. A deep recess houses a spare battery. Lockable Port Rod Locker: The portside rod locker now accommodates rods up to 8-feet in length. Stern Livewell: Deep stern aerated 15-gallon livewell with timer keeps your prizes in prime condition. New! Stern Jump Seats: Two new optional stern jump seats add passenger comfort and fold down as part of the stern casting deck when not in use. Conversion Stern Bench: An optional conversion stern bench welcomes more passengers to the outing. Snap-In Carpet: For extra comfort underfoot, add snap-in carpet runners, custom-fitted to your Crestliner. Available for models with vinyl flooring. Custom Travel Cover: Keep your boat in prime condition with the optional custom travel cover. Swim Platform with Ladder: Swim platform with ladder for easy in-and-out of the water. Easy Access Fish Ruler: Record your catch with the easy access fish ruler. Stores neatly in the center rod locker. Pro Seats: Fishermen on longer treks will appreciate the additional support of the high-backed Pro-Style seats. Platinum Edition Package: Platinum Edition package includes 3D chrome logo, chrome Platinum Edition Badge, stainless steel steering wheel and stainless steel flip up cleats. Overall Length: 17 ft. 9 in. Boat/Motor/Trailer Length: 22 ft. 9 in. Boat/Motor/Trailer Width: 8 ft. 6 in. Boat/Motor/Trailer Height: 6 ft. 2 in. Max Cockpit Depth: 22 in. Weight (Boat only, dry): 1,480 lb. Max Weight Capacity: 1,710 lb. Aluminum Gauge Bottom: 0.100 in. Aluminum Gauge Sides: 0.090 in. Aluminum Gauge Transom: 0.125 in. Active duty service member & former service members who were honorably discharged: Provide a Leave and Earnings Statement (LES), or provide a recent pay-stub, or provide a Delayed Entry/Enlistment DEP form. Retired service member: Provide a DD 214/NGB 22, or provide other supporting documentation. Immediate family members (mother, father, brother, sister, spouse, child) of service member killed in military conflicts: Submit a Death Certificate verifying service member was killed in military conflict dated 1991 or later, or submit Record of Casualty Notification Actions dated 1991 or later, or submit an official military condolence letter dated 1991 or later. Service members from other countries such as Canada and Australia should provide death notice paperwork applicable to that country's armed forces. *Discounts vary by model. The Outreach and CR Jon model families are not eligible for this program. 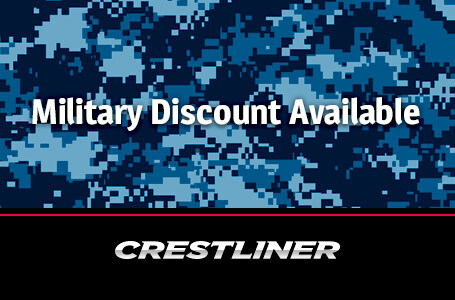 Available on select models through participating Crestliner dealers. See your dealer for details. Discount program may be terminated at any time without notice. All prices reflect MSRP in US dollars and apply to the US only. International customers must contact their local dealer to obtain accurate pricing. Pricing does not include dealer preparation fees, taxes, freight, registration fees or optional equipment. Dealer alone sets the final retail purchase price.